McLaren’s star Lewis Hamilton is edging closer to his dream result of winning this season’s drivers’ title after an awesome display of wet weather driving in the rain-drenched Japanese Grand Prix. With Lewis winning the wet Fuji race, Alonso now faces a difficult challenge of sustaining his championship honours over his British rookie, who is now leading the standings with 12 points. If Hamilton finishes ahead of his Spanish team-mate in the following Grand Prix at Shanghai next weekend, he will become world champion of 2007. Renault’s Heikki Kovalainen finished in his career-best position of second, followed by the determining Kimi Raikkonen in the Ferrari. The ‘Iceman’ had earlier fallen to the rear of the field in the first part of this dramatic Grand Prix. With the treacherous wet conditions at the Fuji Speedway, the first 19 laps of the race were run behind the Safety Car due to the appalling visibility. Even though the whole Formula One field were instructed by race control to start on extreme wet tyres, the Ferraris were both fitted with intermediates, forcing Kimi Raikkonen and team-mate Felipe Massa to make necessary pit-stops during the caution period. Meanwhile at the front, the two silver cars were leading the field but the race still wasn’t under way. It looked like the Japanese Grand Prix would become a parade of racing cars travelling slowly behind the Safety Car… But when the race officials decided to assess the conditions by allowing Tonio Liuzzi, who was a lap down, to unlap himself and catch up to the back of the racing pack, it was then the lap time from the Toro Rosso driver became significant enough for Charlie Whiting to let the racing commence. The Safety Car came in at the end of lap 19 and the race resume with Lewis Hamilton leading Fernando Alonso. Behind, there was chaos as Nick Heidfeld was hit from behind by Honda’s Jenson Button. In addition, Alex Wurz lost control of his Williams under braking into Turn 1 which resulted in the Austrian colliding into the back of Massa, who went into another spin! Button, amazingly continue his race without a front wing and was setting reasonable times. But after a few laps, the Honda driver was forced to come into the pits to repair the damage. Speaking of Sebastian Vettel, the young German was driving a superb race. He actually led a couple of laps when the McLarens were in the pits and it would have been a wonderful result for the team to finish on the podium. But alas, he made a rookie mistake when he crashed into Mark Webber’s Red Bull during the second Safety Car period… Webber was furious as he was heading for a podium and that incident cost both Toro Rosso and Red Bull Racing a chance of scoring big points in Fuji. Why was the Safety Car out on track again? Well, it was called out as Fernando Alonso suffered heavy damage after losing control in his McLaren on the wet surface. His shunt could be the deciding factor in this year’s world championship and it was a shame for the Spaniard as he was recovering from his earlier pit-stop. Once the debris was cleared away, the race restarted and Hamilton continued to lead from the front. The British driver was driving brilliantly at the point of the race despite a lack of knowledge of racing in the wet. Lewis even survived a scary moment when he was hit from behind by Robert Kubica’s BMW-Sauber, which resulted in both cars spinning. But luckily, Lewis kept the engine running, rejoined back on track and went onto win the race. As for Kubica, he was given a drive-through penalty for the racing incident. Finishing in fourth was David Coulthard in the Red Bull. The Scottish driver was racing with a special Colin McRae-themed helmet as a tribute to the late World Rally Champion. It certainly helped Coulthard’s luck in the wet conditions as he recorded yet another points finish for his team. Giancarlo Fisichella finished fifth after a so-so race in the Renault, while Nick Heidfeld lost sixth position when his BMW-Sauber began to misfire and was forced to retire just two laps from home. That position went to Ferrari’s Felipe Massa, who drove a storming race from the back. The Brazilian even had an exciting wheel-to-wheel battle with Kubica on the final lap that was reminiscent of Dijon 1979 and the battle between Gilles Villeneuve and Rene Arnoux. And finishing in the last remaining championship point was Toni Liuzzi. After starting the race in the pit-lane, the Italian scored Toro Rosso’s first points of the season. But race stewards decided to penalise the driver for overtaking under yellow flags. So it was Spyker that scored its first point of the season instead, courtesy of another strong drive from Adrian Sutil. Hamilton’s fourth Grand Prix victory means he leads the title chase with 107 points to Alonso’s static 95, while Raikkonen is now up to 90 points. Massa, on 80, is now officially out of the title chase with two races remaining. The next race follows immediately at Shanghai for the penultimate race of this exciting season. Lewis Hamilton’s dream of winning the title in his first season of becoming a Formula One driver is only a week away. Can he do it? It certainly looks like it judging by his commanding drive here at Fuji. As the Formula One season approaches its dramatic climax with three critical races for the four championship contenders, it was McLaren’s Lewis Hamilton who managed to rise to the occasion with a stunning lap in the final moments of qualifying to steal pole position away from team-mate Fernando Alonso. Initially, the whole session was subject to delay as the appalling wet weather conditions around Mount Fuji fail to improve after the race organisers forced the abandonment of third practice due to fog. It seem that the qualifying hour was heading the same way – with fears it might be put on hold until Saturday evening or at worst, Sunday morning – but in the event, the conditions were deemed acceptable and qualifying took place on schedule. It has been thirty years since Formula One raced at the Fuji Speedway – scene of James Hunt winning his only drivers title. The Toyota-owned race track is a stark contrast to Suzuka, as this re-profile circuit offers a good chance of overtaking thanks to that mile-long start/finish straight. As ever, qualifying is essential for drivers looking to score points and Lewis Hamilton not only manage to beat his main championship rivals in the session, but also gain physiological advantage over Alonso with his fifth pole position of the year. The British rookie has won from this top grid position three times and if Hamilton manages to win at Fuji on race day, he will extend his slim championship lead as we head into the final two races of the season. McLaren team-mate Fernando Alonso looked to be the driver to start in the top spot after setting the pace with a lap time of one minute, 25. 438 seconds. But right at the end of Q3, Hamilton banged in an amazing do-or-die lap time of one minute, 25. 368 seconds to grab pole position and head another McLaren front row. The Ferraris were left trailing with Kimi Raikkonen in third (one minute, 25.516 seconds) and team-mate Felipe Massa fourth (one minute, 25.765 seconds). The performance between the F2007 and the MP4-22 should be fascinating as it’s still to close to call on who has the advantage on race day. The lap times between the four drivers in the top two cars are separate by a matter of tenths of a second. Behind the usual suspects is Nick Heidfeld in the BMW-Sauber, who continues his impressive consistence in the F1.07 by again out-qualifying his team-mate Robert Kubica (the Polish driver will start in ninth). Williams-Toyota’s Nico Rosberg originally qualified in sixth but due to an engine change in Friday’s practice session, the German will drop back ten places on the grid. This promoted Jenson Button in the Honda, who was sublime in the wet conditions. The British driver achieved his best-ever starting position after a year-long of frustration in the Earth-livery Honda. He was significantly quicker than team-mate Rubens Barrichello – a driver who is exceptionally good in the wet – and yet, the Brazilian struggled with P17. Row four goes to the Red Bull drivers of Mark Webber and Sebastian Vettel, with the latter arguably the star of the qualifying session. The German rookie was extremely impressive in the slippery conditions, and by qualifying in eighth he earns the Toro Rosso squad their first-ever top ten start in Formula One. The weather forecast remains unsettled for Sunday, and at this moment in time the 2007 Japanese Grand Prix at Fuji has the look of one of those races in which anything could happen. Season 2 of Heroes returns with a bang! One of my favourite television shows last year was Heroes and after watching all 23 episodes in season one, I have become addictive to the story and characters in this hit drama series. I’ve even met the stars of the show including the cheerleader! And with the news that the BBC showing all of season one on terrestrial television, it highlights how Heroes has become so popular with viewers. This week in America, the second series is on the air and I’ve managed to download the premiere episode set in the immediate aftermath when Peter Petrelli so-called ‘exploded’ over New York City. I won’t be spoiling any details but after watching ‘Four Months Later…’ I predict this could be a spectacular season for the cast of Heroes. In addition, the new members bring a new perspective into the show with new secrets and powers. So step aside Jack Bauer, as the people who have extra-ordinary abilities are here to save the world once again! Last weekend, I went aboard with a group of mates to attend the Belgian Grand Prix at the wonderful Spa-Francorchamps circuit. 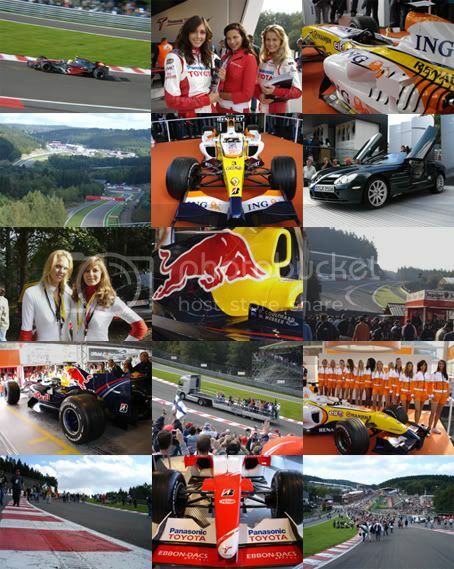 We always wanted to go to this Formula One race as its picturesque – set in the Ardennes forest region of Belgium – and it was reasonably cheap to travel. I’ve managed to persuasive two of my best friends to travel with me. Both have been following the sport with much interest this year thanks to competitive racing and the rising talent of McLaren’s Lewis Hamilton. Neither has been to a real Grand Prix before, so I thought it would be a nice treat to let them experience the raw speed of these racing cars at a fantastic race track at Spa. Initially there was a slight problem when purchasing the grandstand tickets before the trip – as I wanted them to see the Grand Prix at Eau Rouge with me – but in the end, they had a better view of the race track! We first meet up in London’s Victoria coach station on Thursday. This was also the day when the World Motor Sport Council decided the fate of McLaren over new evidence in the latest series of the spy scandal that has rocked Formula One this year. I didn’t get the news until later that day, but I managed to get constant text updates from my friends regarding the final verdict. Go for the iPhone or the iPod Touch? Now that the iPhone is heading to Europe on November 9th (only on the O2 network), I am now debating whether to get the highly desirable mobile device or get the new iPods. As I previously posted here, Apple release a whole range of new music players for 2007 with the even-so thin iPod Nano, the iPod Classic (based on the fifth generation iPods) and the wonderful touch-interface iPod Touch. Personally I like the iPhone as it features more applications like Google Maps, Weather, Stocks and Mail. All of these modes are unavailable on the iPod Touch but with the UK price of the iPhone valued at £269 – not including the cheapest tariff at £35 per month – it is difficult to justify if I need this Apple product at all. Nevertheless, I had the opportunity to test out the iPod Touch at my local Apple Store to see if it lives up to Steve Job’s hype as the ‘best iPod from Apple’. After playing with the device for around an hour I must admit it’s pretty impressive. First off, the screen looks gorgeous. Crystal clear display that also scratch proof. Watching movies and flicking though a selection of digital photos feels great and you certainly feel amazed by the detail this glossy screen can show. Another impressive feature is how thin it looks. Apple fitted a Flash-based Hard Drive to keep it slim (and also to improve battery life) so when you pick it up, it feels nice and comfortable in your hand. It is significantly thinner than the iPhone but it would have been better if was more than 16 gigabytes… Still, the improvements of Flash drives over time mean we will get a bigger capacity iPod Touch eventually. I really like the touch screen element as its highly responsive and accurate. The interface is well designed and you can just select the different options just by lightly pressing the screen to access the features like music, photos and videos. Speaking of functions, the music mode is essentially a great-looking iTunes music player. If you rotate the iPod Touch to one side, you get Cover Flow. By flicking your finger across the screen, you can browser through your music collection in a style of a jukebox. When you found a particular album you want to listen to, press it and you are given a selection of tracks that are featured on that album. Highlight the track you want to listen to and it plays! You can also view your music in a list format under artists or album if you choose to wish. To browser your tracks list, just move your finger up or down on the screen. In Photo mode, you can browser through your selection of digital photos similar to iPhoto on the Mac, but with an element of touching! I like the idea of ‘pinching’ the screen to zoom in as its fun and interactive. In addition, it’s clever that you can rotate the images to landscape or portrait position just by turning the iPod Touch from side to side. As for playing videos, the moving images look pretty good and you can even change the screen ratio just by taping the display. So far the iPod Touch is living up to its hype with positive reviews, but sadly the online features such as Safari (the web browser), YouTube application and iTunes Wi-Fi Store means I have to admit it doesn’t get the full appreciation it deserves. Even though it uses Wi-Fi, the online mode is incredibly slow, which is surprising to say the least – perhaps the Apple Store’s bandwidth was quite sluggish as many people were playing on the desktop computers in the shop? Whatever the true reason, you are not that impressed by how slow it can open a web page or access YouTube videos. It took around 30 seconds to render a web page (not good) but at least it doesn’t contain any errors. Once it is done, you can tap the screen to zoom in, meaning you can read the text more clearly. You can even rotate the iPod Touch to display the web page in a landscape position. If you want to type in a web address, a virtual keyboard appears. It looks uncanny to Animal Crossing: Wild World on the Nintendo DS! Pressing the individual letters is quite tricky at first but with more practice, you can type out web addresses or messages faster. As for iTunes Wi-Fi Store, this was also slow to access. Perhaps if the wireless Internet connection was less clogged up with bandwidth traffic, this and the other online modes will be faster? Whatever, it is still annoying to wait for the screen to load before making you purchase for new music tracks. That said, the iPod Touch is still an excellent music player and the touch interface works well. But you are left feeling frustrated by its slow online capabilities, its high price (£199 for the 8 GB model and £269 for the 16 GB version) and short battery life. But when you consider how beautiful it looks and what it can do despite it flaws, you can’t say no can you? But ironically, I am favouring towards the iPod Nano and iPod Classic. Sure, it doesn’t have the slick touch-screen but these two models are an improvement over the previous generation iPods. As for the re-branded fifth generation iPod named as ‘Classic’, the music player feels ever so familiar. It has the scroll wheel, a display and a large Hard Drive (now up to 160 GB!) to store all your music, pictures and videos. Only two colours are available which are silver and black. I don’t know why Apple called it ‘Classic’ as the original white colour is not present… Personally, the silver version of the iPod Classic looks nasty but not so when in black! With 160-gigabyte Hard Drive, this is the biggest data capacity Apple has done for the popular MP3 player. And it is not even that thick when viewed from the side! For only £229, this iPod is exceedingly good value. Both the Nano and Classic has a new interface with Cover Flow for browsing your music collection. But it feels really sluggish at displaying the album/singles covers compare to the silky-smooth iPod Touch. Other than that, both iPods are a major improvement over its previous generations with a better screen and battery life. And yet I am still deciding whether the iPhone is ideal for me. November 9 is the official release date when the O2-exclusive mobile phone is available on the market. But for the price you’re paying to use this glamorous electronic is a bit much in my opinion (£269 + £35 per month). I might go for the 16 GB iPod Touch in the end… or possibly the 160 GB iPod Classic. Damn it! Finland’s Kimi Raikkonen headed home Ferrari team-mate Felipe Massa in Sunday’s Belgian Grand Prix with a dominant performance that clinched the Italian outfit of the 2007 constructors’ title. The McLarens were no match for the red cars and had to settle for third and fourth, with Fernando Alonso finishing ahead of Lewis Hamilton and narrowing the rookie’s championship lead to just two points with three races remaining. Massa had briefly challenged Raikkonen on the outside at the start, before settling into second position. Just behind the pair, the McLarens were also wheel-to-wheel into the La Source hairpin. Alonso edged Hamilton onto the extended run-off area, but Lewis had better traction and accelerated back on track level with his team-mate. They then ran side-by-side into Eau Rouge, with Alonso holding on around the outside at the first part of the corner before claiming third as the race track turned right. Raikkonen proceeded to dominate the 44-lap race, easily establishing a four-second lead over Massa and maintaining it to the chequered flag. Raikkonen’s victory at Spa-Francorchamps means he retains a mathematically chance of taking the title away from the McLaren duo, cutting his deficit to Lewis Hamilton to 13 points with 30 still up for grabs – although Kimi hopes that the Mercedes-powered team’s impressive reliability falters. Nick Heidfeld continued his consistent points finishes for BMW Sauber with fifth though he was pushed wide at La Source to avoid hitting Alonso and Hamilton on the lap one. Nico Rosberg was sixth for Williams with Red Bull’s Mark Webber in seventh. Finishing in the last points finish was Renault’s Heikki Kovalainen after holding off the BMW Sauber from a determined Robert Kubica by half a second. The next stop for the 2007 Formula One World Championship is the Japanese Grand Prix at Fuji at the end of the month. It will be the first time modern Formula One racing cars will be racing at the track, as the last time was back in 1977. The newly re-profile circuit (as designed by Hermann Tilke) will feature the longest straight on the Formula One calendar but in terms of challenge for the drivers, the layout of the race track is pale in comparison to Suzuka. Ferrari secured their first all-front-row start of the season at Spa-Francorchamps with Kimi Raikkonen taking the top spot after beating his team-mate Felipe Massa in qualifying for the Belgian Grand Prix. The Finn took pole position away from the Brazilian by a small margin of 0.017 seconds. Raikkonen’s lap around the Ardennes race track was one minute, 45.994 seconds. Massa felt the pressure from the ‘Iceman’ as he tried to improve his lap time that resulted him making a mistake into the final chicane. As for McLaren – who recently received a record fine of $100 million USD in a breach of article 151c of the International Sporting Code – Fernando Alonso and championship leader Lewis Hamilton could only managed third and fourth respectively. Alonso blew his chances for a top grid position with a spin at Rivage, but the Spaniard recovered and managed to set a time faster than team-mate Hamilton. Robert Kubica qualified his BMW Sauber in fifth but was relegated ten positions after changing his engine before the qualifying session. That promoted Nico Rosberg in the Williams ahead of Kubica’s team-mate Nick Heidfeld. Australian’s Mark Webber lines up in eighth for Red Bull Racing. While the final two top ten spots went to Toyota’s Jarno Trulli and Renault’s Heikki Kovalainen. Judging by the times set by the red cars, it seems the Ferraris has the speed advantage around the fast and flowing Spa circuit. Raikkonen won the event twice and he could go for win number three on Sunday. But can Massa stop him? What about McLaren? Alonso would love to continue his winning form after last weekend’s Monza triumph but I believe both he and Lewis will have difficulty in keeping up the pace over Ferrari. Former World Rally Champion Colin McRae has died in a helicopter crash. The popular Scotsman was a true star on the rally stages and his sudden death was the biggest shock to motorsport fans – myself included. McRae was an inspiration to everyone. His skills as a professional driver were extremely impressive and I will remember him fondly for his wild powerslide moments in the Subaru and Ford Focus rally cars. His computer games were also fantastic to play and his support in the popular gaming series made him a star for video gamers. It was deeply depressing that we lost Colin two years after another British rally hero Richard Burns passed away. Reading the various news articles, I was sadden to learn that his five-year-old son Johnny also perish in the accident along with another adult and child (Graeme Duncan, 39 and Ben Porcelli, 6). McRae, 39, the son of five-times British Rally Champion Jimmy, wrote his name in the record books in 1995 when he became the first Brit to win the World Rally Championship. David Richards, boss of Prodrive, insisted it was his fearless and at times gung-ho approach that won him many admirers in the sport and fans outside it. Nicky Grist, McRae’s co-driver since 1997, said the whole of the rally world was in shock and said McRae was “such a great character”. Fellow Scotsman and Formula One driver David Coulthard said McRae was both “fearless” and “flamboyant”. “He and Alison were good friends and I cannot imagine either without the other,” said Coulthard, who was due to partner McRae in Team Scotland for the Race of Champions at Wembley Stadium in December. Malcolm Wilson, BP-Ford World Rally Team director, added: “I was privileged to have Colin in our team driving for Ford at a time when he was at the peak of his powers. Ex-Formula One driver Martin Brundle, who swapped racing cars with McRae in a publicity stunt in 1996, said: “He was a naturally gifted driver, whatever he was in. I’ve always thought rally drivers are probably the most all-round skilled drivers in the world because of the conditions they have to cope with. Having done a couple of rallies, I know what an extraordinary challenge it is. Colin Hilton, chief executive of the Motor Sports Association, said McRae was an “inspiration to all who knew him and to millions around the world”. He added: “His energy, commitment and extraordinary talent brought him domestic and international success, while his uncompromising style and determination made him the hero of fans everywhere. McRae leaves a wife, Alison, and daughter, Hollie. Rest in peace Colin McRae. We will always remember your superb driving skills forever. After a day-long hearing in Paris, the World Motor Sport Council has issued a verdict on the latest spying saga that has affected the McLaren-Mercedes team in this season’s Formula One World Championship. The WMCS has decided to penalise the Woking-based outfit for breach of article 151c of the International Sporting Code. What this means is McLaren will lose all their championship points this season, effectively making Ferrari the constructors’ champions by default. In addition, the team received the biggest fine in motor racing history ($100 million / £50 million) for their possession of a 780-page dossier containing technical information on Ferrari. However, the drivers’ championship will remain intact so the title race between Fernando Alonso and Lewis Hamilton continues in the remaining races. Furthermore, the WMSC said they will analyse the McLaren-Mercedes car entered to the 2008 world championship later this year to decide what sanctions, if any, should be applied on the team in next year’s championship. My personal opinion is that the FIA has created a bad image on Formula One that has overshadowed a fantastic season of racing. It is not surprising that the general public are more aware of the sport thanks to the achievements by British sensation Lewis Hamilton. I hope McLaren can move on from this spying row and win the drivers’ title this year. The on-track battle between Alonso and Hamilton has been absolutely fascinating for Formula One fans and despite Ferrari winning the constructors’ title by default; I personally believe McLaren are the ‘true’ champions. For the full transcript of the Council’s judgement, please click here. Fernando Alonso stamped his authority on McLaren-Mercedes team-mate Lewis Hamilton with a dominant victory at Monza, cutting Hamilton’s championship lead to three points. It was an important result for the double world champion and for the team after a stressful few days at the Italian Grand Prix. The on-going spy scandal is still taking proceeding in Formula One and we will discover the outcome of this season’s championship in a World Motor Sport Council meeting in Paris on Thursday, September 13. Nevertheless, McLaren and Alonso should be pleased by Sunday’s race result. It was the Spaniard’s 19th career Grand Prix win and to take the chequered flag in front of the passionate Ferrari fans (tifosi) was a special feeling for the double world champion. As for Lewis Hamilton, he still holds onto the drivers’ title lead over his team-mate by a small points margin. Finishing second was a good result for the British team but it could have been worst if Kimi Raikkonen finished in front of him. But Hamilton was in a racy mood and forced his way past the Ferrari driver with a spectacular overtaking manoeuvre into the first chicane on lap 43. Raikkonen was caught by surprise as he just moved into second place thanks to Ferrari’s clever single pit-stop strategy to promote him a track position. Both cars locked their brakes into the first corner and it was lucky that both drivers didn’t make any contact. A great pass by the Formula One rookie but Kimi should have defended more aggressively. Nick Heidfeld continued his consistent points finishes with a fine fourth for BMW Sauber, finishing ahead of team-mate Robert Kubica. Nico Rosberg was sixth for Williams after fighting off a determined Jenson Button. The Honda seemed to be working much better in the low-downforce configuration at Monza and it was fascinating to see the duel between Rosberg and Button in the 53-lap race. In the end though, Renault’s Heikki Kovalainen finished between the pair. There were two non-finishes in Sunday’s Italian Grand Prix and one of them was a championship contender, Ferrari’s Felipe Massa. The Brazilian had a frantic opening set of laps trying to pass Hamilton’s McLaren. But was forced to retire early with mechanical problems, hitting his title hopes and the team’s. The other driver to retire from the race was David Coulthard. The Red Bull driver suffered a front wing failure (as the result of damage after hitting Giancarlo Fisichella’s Renault in the first chicane) and speared hard into the wall at the Curva Grande. The Scot escaped unhurt in the high speed accident. So a perfect result for McLaren with first and second in Ferrari’s home race. This season’s Formula One World Championship is becoming tensed with four races remaining. But could politics rather than supreme driving talents of Alonso, Hamilton, Raikkonen and Massa decide the fate of the championship?